There is general concern that civil infrastructure has not been adequately maintained to meet society's needs throughout the 21st century. Buried sewers and drains are major components of this infrastructure and their actual condition at specific locations is affected by many factors. As networks age overall damage is becoming more apparent and is being accelerated by more hostile effluents entering the systems. Many networks experience regular collapses at unexpected locations and emergency flow diversions frequently create environmentally damaging spills. The cost of emergency repair often exceeds that of regular maintenance and replacement costs are rising rapidly. Currently managers of underground networks rely on condition assessments primarily based only on internal visual or CCTV inspection. These assessments are inadequate because they fail to effectively sample, test and account for external ground conditions. Unexpected, catastrophic ground collapse due to sewer or drain failure invariably causes major disruptions and sometimes fatalities. Non-destructive testing with geophysical technologies such as high frequency (1400 MHz) Ground Penetrating Radar operating within and external to a conduit and specially developed seismic imaging methods such as SEWREEL, have demonstrated the ability to test both the conduit and external ground conditions, locating pipe distress, voids or weak ground. Application of these non-destructive technologies leads to more effective condition assessment of buried infrastructure as is demonstrated with case studies from Australia and USA. Much of the world's buried infrastructure is in the form of non-ferrous sewers and drains, substantial sections of which are in an aged condition, well exceeding their design life. There is widespread concern that networks have not been adequately maintained to meet the needs of society throughout this century. Pipe damage is becoming more common and is being accelerated by more chemically aggressive effluents and the greater demands from expanding populations. Many networks now experience regular collapses, often at unexpected locations, requiring emergency flow diversion that produces environmentally damaging spills. Unexpected, catastrophic ground failure, due to sewer collapse, has caused fatalities and invariably causes major disruptions to commerce. The cost of emergency repairs often exceeds that of regular maintenance. Excessive expenditure on rehabilitation and foreshortened repair life are also consequences of failure fully understand and evaluate the influence of ground conditions above and around these conduits. Replacement costs are rising rapidly, restricting the replacement length and placing additional pressures on rehabilitation rather than replacement solutions. Given the seriousness of this situation, it is surprising that managers of these underground networks rely primarily on condition assessments based on internal visual or CCTV inspection. These assessments are inadequate because they fail to effectively test the internal condition of the pipe liner and to account for the external ground conditions. Consequently, there is considerable scope for the application of non-destructive testing technologies. Most of the older and larger sewers and drains are either brick lined, cast-in-situ concrete, reinforced concrete pipe while the newer and smaller diameter conduits may be vitreous ceramic or high density plastics. Any non-destructive testing method should be able to operate within these types of pipe. It is also important to recognise that, to be effective, any such testing must operate over several ranges or scales i.e. a short range scale that tests the liner condition with a 50 mm to 500 mm depth of investigation and a spatial resolution or 50 mm or less, an intermediate scale that examines the interaction of the liner and the surrounding rock or soil with a1 to 2 m depth of investigation and a spatial resolution of 50 mm or less and a larger scale that examines the geotechnical conditions around the conduit, particularly between the pipe and the ground surface with a 2 to 50 m depth of investigation and a spatial resolution of 1 to 2m. At present no single non-destructive testing or geophysical technology can satisfy all these requirements but a combination of methods can be applied. Specially adapted Ground Penetrating Radar technologies can be used to examine liner conditions and the ground conditions immediately external to a pipe, however, these methods have limited range and can satisfy only the first two requirements. 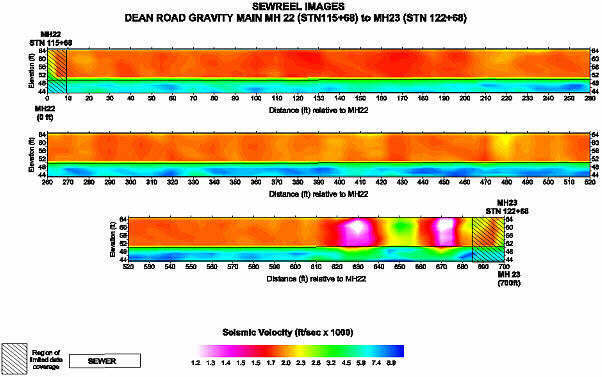 The third requirement can be satisfied with specially developed seismic imaging methods such as SEWREEL that are based on tomographic analysis can test external ground conditions and locate significant voids or weak ground above the sewer to the ground surface. Condition assessment of drains and sewers should be achieved with a systematic program that establishes the actual condition and the need for corrective actions. The major elements of this program include the collection of historical data, internal visual or CCTV inspection, hydraulic analysis, structural condition assessment and corrosion potential assessment and geotechnical assessment. Experience has shown that no single element alone is adequate. In practice, structural condition and geotechnical assessment are the most costly and difficult elements. Corings from within the pipe that are taken as part of the corrosion potential, can provide access to the exterior of the pipe where samples can be collected for laboratory testing. These can also be used calibrate other non-destructive testing methods such as high frequency radar that is described below but are expensive and difficult to obtain. Conventional geotechnical investigations involve an analysis of background information and traditionally include drilling a series of holes along the alignment of the sewer to define soil and groundwater conditions. Again these are costly but provide calibration for the SEWREEL method also described below. The theory of the GPR method has been presented elsewhere (e.g. Concrete Society, 1997). Essentially GPR testing uses the large differences that exist between the dielectric constants of engineered materials in good or design condition and those that are deteriorated or are not at specification. These contrasts occur because liner materials (e.g. concrete, brick) have a small range of dielectric values whereas natural material (e.g. air, water, soil, rock) have a large range of and very different magnitudes to the engineered materials. A high frequency GPR system that has been constructed that has an ability to operate in the hostile environment underground and offers immediate display of results for quality control, field optimisation and interpetation. This system which operates at 1400 MHz and is described by Murray et al. (2000) and is shown schematically in Fig. 1. It has a nominal pulse resolution of 30 mm that is produced by a bistatic antenna with the transmitter and receiver in one unit. The portable antenna has dimensions of 200 mm by 100 mm by 100 mm and is housed in a waterproof container that is connected via a short cable to a battery-powered control unit. The control unit is carried by the operator in a waterproof backpack . The operator can adjust instrumental settings as required. For example, the radar acquisition time base can be altered from 4 to 25 ns, different linear gain slope functions and variable gain may be set in the range 0 to 40 dB to suit changing conditions. The control unit itself is linked to a remote voice intercom and digital data acquisition system with a copper cable and transformer isolation. Both analog radar data and 2- way, hands-free voice communication can be achieved over distances exceeding 500 m without any loss of data quality. The isolated cable system (Fig. 1) is a twin pair cable, each with its own shield and a shield around the pair. Screened audio-type transformers having a frequency response of 100 Hz to 5 kHz are used on both information channels. Three winding pulse transformers transmit the frame synchronisation pulse that has a width of 15microsecs at a repetition frequency of 56 Hz. 12-bit digital data is acquired on a portable PC at the remote data collection site (Fig. 1) using GPR Viewer V202 software (A.F. Siggins and Associates) that also displays the GRP data as it is acquired. The radar data can be saved as a bitmap or in SEGY format for further processing. The GPR operator calls location information over the intercom and position marks are manually placed on the GPR record by single computer keystrokes. Normally the radar data is displayed at 16 colour levels but a grey scale can also be selected. Using this immediate display the computer operator can assess data quality and request further radar scans with different equipment instrument settings if required. This means that repeat or additional scans can be completed at the time without the necessity to re-occupy difficult sites. Fig 1: Schematic of High Frequency GPR system. Before deployment, the GPR system was tested on a physical model constructed in the laboratory. These simulate concrete tunnel liners with various levels of damage which was represented by sand, cemented sand and cemented crushed rock containing voids and metal reinforcing bars (Siggins and Whiteley, 2000). The high frequency radar system demonstrated a spatial resolution of 19 mm and detected metal reinforcing rods and small voids, i.e. completely corroded reinforcing at 200 mm depth. Fig 2: Radar response to void simulating a heavily leached concrete liner with completely corroded reinforcing. Fig. 2 (from Siggins and Whiteley, 2000) shows a radar image over one of the liner models where crushed rock represents heavily leached concrete and a cylindrical void represents a completely corroded reinforcing bar. The raw radar image shows both of these features clearly. The direct pulse obscures any information from the upper 50 mm of the model. The hyperbolic signature of the small void was processed using a diffraction stack algorithm (Siggins, 1990) to sharpen the image of this feature as also shown on Fig. 2. 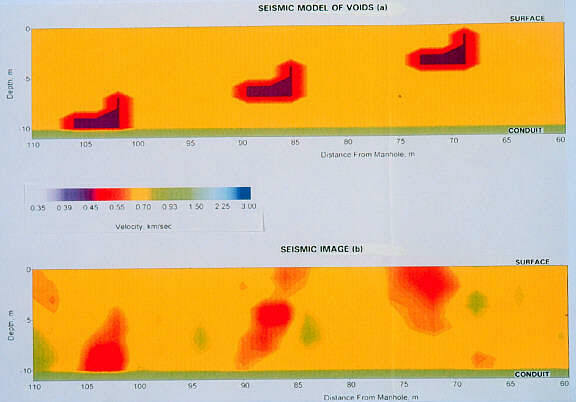 Fig 3: High frequency radar image of distressed concrete liner. Until year 2000, the sewerage and wastewater requirements for about 1 million people on the north side of Sydney Harbour were served by the NSOOS (Northern Suburbs Ocean Outfall Sewer). This is a 230 to 300 mm thick, cast-in-place concrete conduit with a flat or arched roof about 2.3 m by 2.3m that was built over 70 years ago and has been extended since that time. The older section of this conduit was hand-tunnelled in sandstone/shale rock where construction problems occurred when large joints and faults were encountered. Over this section regular visual or CCTV inspection showed some liner deterioration but no clear evidence of distress. About 5 km of the older tunnel was scanned with the GPR system and accessed via manholes that were about 500 m apart. It was not necessary to bypass pump the fluids in the sewer during the radar testing although some sections still had to be tested from a specially constructed raft that ensured the radar antenna was in intimate contact with the liner. It was also necessary to rough-brush the liner surface along the scan profiles to remove excess sludge and other materials. In fact, this proved to be the major difficulty in acquiring high quality radar data. Fig 4: Circumferential radar scan of distressed brick liner. Overall the liner proved to be in relatively good condition considering its age except for a number of sections that the radar testing identified. Fig. 4 shows a radar image of one 20 m length that shows significant liner distress. The liner was in fair or good condition and in relatively intimate contact with the rock (some minor voiding may be present) where the GPR image shows regular reflections, e.g. from 0 m to 4 m. Where the liner surface is deteriorated the shallow radar reflections become more irregular e.g. from about 4 m to 12 m. and from 16 m to 17 m. These areas were often noted on CCTV inspection records but were sometimes missed due to thicker sludge coating whwhere the liner was degraded. The irregular radar reflections near the back of the liner between about 0.2 and 0.3 m depth represents a more serious problem of delamination voids where the liner has separated from the sandstone rock and is no longer being supported by it. This area was selected for coring. A core at 11 m showed that the liner was in poor condition with many pinhead voids, as large as 5 to 10 mm in diameter from 0.11 to 0.2 m depth. An open fracture was observed at the back of the concrete at 0.32 m depth with sandstone beyond this depth. A cross-section of a typical double-brick drain in Melbourne, Australia is shown in Fig. 4. This has approximate dimensions of 1.5 m by 1m. This particular drain is over 100 years old and was hand-tunnelled. The liner was cemented to the surrounding basalt rock in which the drain was constructed. Four longitudinal 1400 MHz radar scans of this drain were completed with circumferential scans where distress was observed. Fig. 4 is an interpreted circumferential radar scan at 110 m along the drain. This image shows a form of distress commonly observed in crown of these structures. Missing brick in this area provide further visual evidence of deterioration. The radar image shows voids behind the brickwork near 0.2 m depth and the degraded concrete in this region produces a disturbed radar image. Further evidence of distress is provided by the radar image that shows voids are present near the back of the concrete liner indicating that it has delaminated from the rock. A drain in this condition can collapse if a surcharge event occurs after heavy rain so this condition was notified and the distressed liner repaired. While radar can provide detailed information close to the conduit SEWREEL testing was developed to provide detailed information on the materials between the sewer and the ground surface where access to the length of sewer pipe is available. In the SEWREEL test an array of closely-spaced hydrophones are encased in an oil-filled tube,called an "eel," that is placed along the invert. Seismic coupling is provided by wastewater or sludge. The eel remains stationary while an impact seismic energy source is deployed at the ground surface above the sewer at close spacings along the sewer alignment. Figure 5 shows a typical field layout for SEWREEL testing. Fig 5: Schematic of a Typical Field Set-up for SEWREEL testing. This form of ground testing can be performed in live sewers to a depth of about 40 m at a rate up to 300 m per day in a city with typical resolution plus or minus 1m horizontally and plus or minus five percent of depth to the sewer invert vertically. Voids as small a 0.6 m high and 3 m long have been observed with SEWREEL over shallow sewers and drains. Fig 6: SEWREEL images of model voids. SEWREEL tests the dynamic elastic properties of earth and materials surrounding the sewer using P-waves and seismic tomographic imaging (STI, Whiteley, 1998). Fig. 6 shows a synthetic example of a vertical section through the earth with voids represented by seismic low velocity zones at different depths in an otherwise uniform earth. Each colour represents a different seismic velocity and the ground surface is at the top and the conduit is at the bottom of Fig. 2. The initial velocity model in Fig. 6a is made up of 2 m wide by 1 m high pixels.seismic and the image obtained by inversion of this model with a 4 m source spacing at the surface and 2 m detector spacing is shown in Fig. 6b. As can be seen in Fig. 6b the numerical inversion is not perfect and while all the voids are observed in the STI they are slightly blurred and distorted. Also some higher velocity zones (artefacts) have been introduced by the inversion algorithm. These are not real and demonstrate that care has to be taken in interpreting seismic tomographic images. However, seismic images such as those in Fig. 6b would be sufficient to alert managers to a potential problem and its likely impact on the conduit and any surface structures. The information obtained from SEWREEL imaging, calibrated with the other information is a non-destructive means of providing a continuous image of conditions at any specific site and does not require the engineer to rely solely on published historical or spot samples during evaluation and design of a project. Fig 7: SEWREEL Images of the Crane Strand Wastewater Interceptor from MH 22 to MH 23. The City of Orlando, Florida has had roadway subsidences and collapse along section of the Crane Strand Waste Water Interceptor sewer. This is about 20,000 feet (6100 m) of 72 to 85 inch (2.8 to 3.4 m) diameter reinforced concrete pipe with 500 to 700 feet (152 to 213 m) between manholes. This gravity main receives the total wastewater flow from east Orlando and sections had been previously rehabilitated by slip-lining. Further rehabilitation efforts were, however, required due to failure of the interior PVC liners and leaking joints that were allowing infiltration and causing soil erosion around the sewer. A review of all available information (Kunihiro et al. 2000) showed that the sewer was located in silty sand with some clay and peat and was installed by trenching and backfilling with select common fill consisting of native soil without the clay and peat. Depth to the crown was from 9 to 20 feet (2.7 to 6.1 m) and the alignment was mainly below and asphalt roadway or grassed median strip. The water table away from the sewer was between 4 and 12 feet depth (1.4 and 3.7 m). A total of about 16,000 feet (4.88km) of this sewer were tested with SEWREEL. at the time of the SEWREEL testing. Fieldwork which was completed during the day while the sewer was operating in normal flow conditions. A hammer source was used at 10 feet (3.1 m) intervals and the detector spacing was 6.6 feet (2 m). The SEWREEL images were produced using a 2 by 5 feet (0.61 to 1.52 m) pixel size. The image from manhole 22 (MH 22) to MH 23 is shown in Fig. 7 and Table 1 provides a guide SEWREEL image interpretations in sandy soils or fills above the water table. The very loose and loose soils for the standard soil classification corresponding to low seismic velocities below 1700 ft/s (< 0.52 km/s) are generally, highly permeable, unstable and prone to collapse. Table 1: Guide to SEWREEL image interpretation in sandy soils or fills above the water-table. Between MH 22 and 23 two areas of very low and low seismic velocity (Table 1) were identified as possible collapse regions 630 and 670 feet (192 and 204 m) upstream of MH 22. Shortly after this prediction a minor road collapse occurred at 670 feet (204 m). A total of 7.5 cu. yards (5.7 cu. m) of grout was injected to stabilise the ground at this location. Similarly 3.5 cu. yards (2.7 cu m) was injected at the 630 feet (192 m) location. The SEWREEL testing identified a total of 40 regions of "weak ground" including voids. Only a few of these showed evidence of road subsidence or were confirmed by internal visual inspection demonstrating the inadequacy of observation alone. The City of Orlando has now initiated a pro-active grouting program to reduce costs associated with road repairs, sewer repairs and damage or injury resulting from a vehicle hitting a hole caused by road subsidence above this sewer. The high frequency radar system operating at a central frequency of 1400 MHz has proved to be a useful and versatile tool for non-destructive testing and examination of the internal conditions of concrete and brick tunnel liners, readily identifying voids and distress close to the tunnel. It is anticipated that this and similar radar systems will be increasingly applied to improve the management of road and waste transport infrastructure. SEWREEL seismic imaging provides significant information about subsurface conditions related to soil densities and passive soil support external to underground sewers and drains. This represents a substantial improvement over the tools previously available for determining conditions that may put an underground pipeline at risk of failure. The most important aspect of this technology is the ability to locate defects or conditions that will eventually threaten the pipeline before distress has progressed to being a concern to public safety. Seismic imaging allows observation of subsurface conditions prior to problems occurring at the ground surface or inside the pipeline, allowing preventive engineering rather than reactive restoration. The combined application Radar testing and SEWREEL imaging as part of a condition assessment program provides a means of establishing the subsurface condition of the soils around the pipe in a reproducible, timely, and efficient manner. Any comprehensive program of condition risk assessments for buried sewers and drains will benefit from the application of these non-destructive technologies as key components in a preventive engineering and risk assessment and reduction strategy. Concrete Society 1997, Guidance on Radar Testing of Concrete Structures, Tech. Report 48, 88p. Kunihiro, C., Frey, S., Oyler, A. and Whiteley, R. J. 2000 SEWREEL Evaluation prevents sewer collapses around gravity main in Orlando, Florida. Presented at session 57, WEFTEC 2000, 73rd Ann. Conf. & Exposition on Water Quality and Waste Water Treatment, Anaheim, Calif. Oct. 14-18, 2000. Murray W, Lewis C, Williams C, Siggins AF, Siggins BF, and Whiteley RJ, 2000 Submersible radar for civil engineering applications. Proc. 8th International Conf. on Ground Penetrating Radar GPR2000. Gold Coast, Aust. 23-26 May, 2000, 55-59. Siggins AF 1990 Ground probing radar in geotechnical applications. Exploration Geophysics 21, 175-186. Siggins AF and Whiteley RJ, 2000 Laboratory simulation of high frequency GPR responses of damaged tunnel liners. Proc. 8th International Conf. on Ground Penetrating Radar GPR2000. Gold Coast, Aust. 23-26 May, 2000, 805-811.